Chain Attack (チェインアタック, Chain Attack) is Shulk's Final Smash. In this Final Smash, Shulk attempts to catch his opponent in front of him with a bright light (similar to Vision's counter particle, except larger) while shouting "Dunban! ", "Riki! ", or “Fiora!” (in Ultimate). If successful, the screen fades to white, and a cinematic with the Vision effect around the screen appears as Shulk summons Dunban, Riki, and (in Ultimate) Mecha-Fiora to assist him. The party proceeds to attack trapped opponents before Shulk sends them flying with a charged Monado slash. The Final Smash deals varying damage depending on which of Shulk's Monado Arts is set-- overall, Buster deals the most damage and the lowest knockback, while Smash deals the best knockback but little damage (41%-55% for Buster, and 15%-20% for Speed, Shield, and Smash). The initial strike from the blinding light deals 3% damage (4% for Buster, and 1% for Speed, Shield, and Smash), and the attack deals 2% for each consecutive strikes (3% for Buster, and 1% for Speed, Shield, and Smash). The final Monado slash will deal 17% damage (23% for Buster, and 9% for Speed, Shield, and Smash), launching the target(s) horizontally. It is capable of KOing opponents at around 40% without any active Arts (20% for Smash, over 80% for Buster). 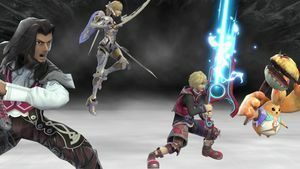 The selected Monado Art, however, cannot be changed after the Smash Ball is acquired since pressing the special move button will start the Final Smash instead. Interestingly, in Ultimate, Shulk can select an art but in a very tight window after activating the Final Smash, but the ability to do this is only possible if Final Smash Meter was on and performed by it. Shulk selecting an Art during a Chain Attack in Xenoblade Chronicles. In Xenoblade Chronicles, successfully scoring critical hits or attacks' bonus effects fills the Party Gauge, which can be spent for various benefits. Filling all three bars of the Party Gauge spawns blue lines that link the three party members forming a triangle, allowing to use a Chain Attack against targeted enemies trapped in the triangle. Chain Attacks freeze time and allow the entire party to use successive Arts on a single enemy, even Arts that have not finished cooling down, although auto-attacks cannot be performed. Chain Attacks reduce the enemy's defenses against status effects, gain damage multipliers for using Arts of the same category in succession, and can continue for up to fifteen hits based on the party's affinity. All phrases spoken by Dunban and Riki during Shulk's Chain Attack in Super Smash Bros. 4 are directly taken from Xenoblade Chronicles. Notably, "On my mark!" is what Dunban can say when a Chain Attack is initiated by him in said game. As part of this Chain Attack, Riki uses his Lurgy Art, while Dunban performs two slashes in a similar manner to Worldly Slash, a physical art that involves a left-handed upward and downward slash combo. Of note is that the Chain Attack featured in Ultimate showcases four characters in the party instead of three, which is impossible in the original game. Chain Attack trophy in Super Smash Bros. for Wii U. In Xenoblade Chronicles, building up the party's team spirit would let them use a chain attack, using multiple Arts in a row to deal massive damage. In this game, Shulk's Final Smash calls party members Dunban and Riki to help obliterate an unlucky target... or multiple targets if you catch more than one in the circle of light! The "Vision" sound effect that usually plays once Shulk connects the Final Smash is actually cut short prematurely if Shulk misses the initial hit. This can be seen in Training Mode, as setting the game speed set to 1/4 causes the cutscene-starting sound effect to play fully, while setting it to 1/2 causes the sound to end suddenly once the missed animation ends. It is actually possible for an active Monado Art to expire during the Final Smash's animation, causing the total damage or final hit's knockback to vary. Despite the attack being initiated by Shulk, it is Riki who attacks first during the Final Smash. In Xenoblade Chronicles, the party leader is always the first to attack during chain attacks, and the fact that Shulk performs the last attack implies he is actually the last one in the party, with Riki as the leader and Dunban as the second party member. It's also to note that Mecha-Fiora's inclusion in the Final Smash in Ultimate isn't possible in Xenoblade Chronicles, as the active party is limited to three characters, and thus only three party members can perform a Chain Attack in-game. With the Smash Art active, Chain Attack is the least damaging Final Smash in the series, dealing only 17%, but is also one of the strongest Final Smashes if so, having KO potential at as low as 20%. Chain Attack gains OHKO power when boosted by the Hyper Smash Monado Art; however, this is very frame-precise, as the final hit must land before the Art's five-second time limit expires. Opponents trapped in the Final Smash loop their stun animations during the beginning of the Chain Attack cutscene. The victims additionally use their stunned voice lines, although it is rather subtle. Chain Attack shares this distinction with Blue Falcon and Mega Legends. They can be heard better if time is slowed down. Chain Attack as shown by a Skill Preview in Ultimate. This page was last edited on March 23, 2019, at 17:05.